Last Sunday I finished the last row of the border and weaved the million endy bits in, to complete this green blanket for a certain Little Postcard with a penchant for all things green. It was started as a Christmas gift for Christmas 2016 and actually was going to be based on Minecraft blocks (hence the solid squares). I’m not the best at sticking to a project however, so when it became apparent I wouldn’t hit the December 2016 deadline it was put away for another time. In the meantime, the fascination with Minecraft waned slightly so I opted for just green squares (with a bit of blue variegated yarn too) and a grey border to bring it all together. He’s very happy with his new blanket and snuggles under it on his bed at night time now – perhaps it was worth the wait! On Sunday evening we went into Ocean Village for a spot of dinner and as we headed for home were greeted by this lovely view. The sunset was almost gone but the colours of the sky and the Sunborn boat hotel lights looked pretty reflected in the water. As I mentioned in last week’s Sunday Sevens I’ve been cracking on with the Coastal Crochet CAL this week and thankfully Eleonora began this week’s pattern with a reminder to check the stitch count on the blanket so far. It turns out that watching Netflix while working on a foundation chain isn’t a good idea … my first week’s progress was based on 136 stitches and not the 180 it should have been – whoops! I had to start again, needless to say and I’m back on track now – phew! I love the way the louvred windows in the new multi-storey carpark make rainbows. I decided to be healthy and take a trip down the stairs this week rather than using the lift and I was rewarded by this rainbow display. A late afternoon trip to Upper Town gave me this fab view of Sacred Heart Church during the ‘golden hour’ as the sun was about to set. 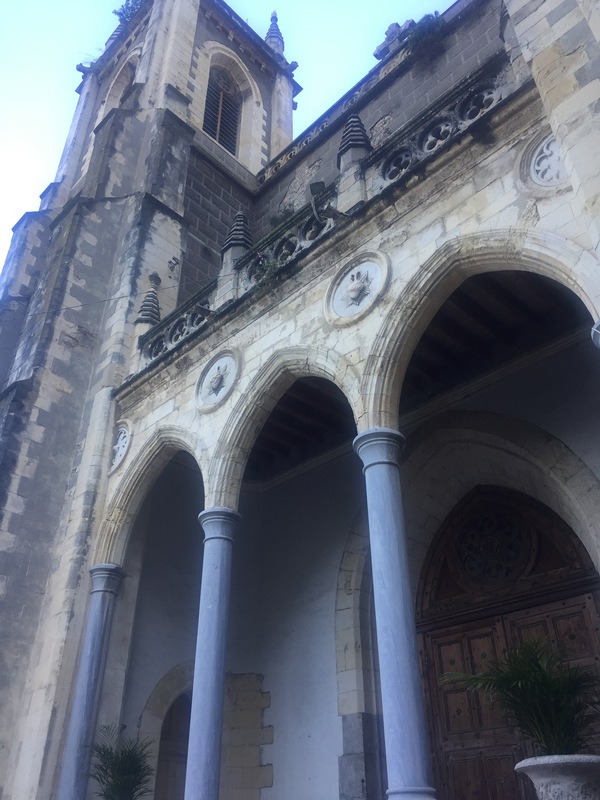 I have featured the beautiful ceiling inside this church a couple of times before in my posts, but I thought you might like to see it from the outside if you aren’t familiar with Gibraltar. In my watercolour class this week, I tried something totally different. I’m using ink to outline my sketch before filling in the colour with watercolours later. I’ve never done something like this before and it was good fun, it even turned out looking like I wanted it to (I’m not the world’s best at drawing – I prefer to attempt to use the paint to make my pictures). Time will tell whether I completely make a mess of it with the paint or not… watch this space! I found myself in the industrial estate beside the Dockyard at the end of this week. I don’t often show the more industrial side of Gibraltar as most of the time I get bowled over with views of the beaches and the Med Steps. I thought the view through this big arched shed was pretty with the sun shining on Spain in the distance. I know I have already reached seven photos and this one will take me up to Sunday Eights, but I had to include it. I heard that our lovely sunny weather won’t last, so yesterday I made the most of the last of the sun and headed up the Med Steps as I might not get the chance to go again for a few days. It was beautiful up there. This photo was taken looking south west across the Strait towards Morocco at the start of the walk before you get onto the Eastern side of the Rock. In the foreground you can just about make out the building site where diggers are excavating the foundations of the new sports facilities which are being built in time for Gibraltar to host the Island Games in 2019. Unfortunately the sunshine hasn’t lasted, as forecast a few days ago, the storms have come. As I type the wind is rattling our old wooden sash windows and shutters and when we were out this afternoon we saw that several trees have been damaged by the gusty winds already. Apparently gales are coming this evening along with thunder storms, so it could make for an interesting night. Where ever you are tonight, I hope you are safely tucked up indoors safe and well. Have a great week! I’m linking with Natalie at Threads and Bobbins for this weekly blog series. Hello there and happy Christmas! We’ve finally reached Christmas Eve and whether you’re ready or not there’s no escaping the fact that the big day day’s tomorrow. I think I may finally be ready, but there’s always something I forget to do…. what will it be this year?! Gibraltar is looking as festive as ever, the town centre looks lovely all lit up. I haven’t taken too many photos of the lights this year, but you can see last year’s light show here. If in doubt stick a sunset picture in! We had a lot of cloudy evenings of late and although we have had a few glimpses of the sun going down between the clouds, a proper sunset as it were has been pretty rare lately. This lovely one was last Sunday night. Oh how I love the interior of Sacred Hearth Church here in Gibraltar. It has got to be one of the prettiest church ceilings around. I was lucky enough to be able to attend a service here this week and had loads of time to admire the stars and stained glass windows as beautiful Christmas carols were sung. At my last watercolour lesson of 2017, we painted some suitably wintery pictures. I love how the snow just ‘appeared’ after sprinkling some salt onto the wet painting – just magic! 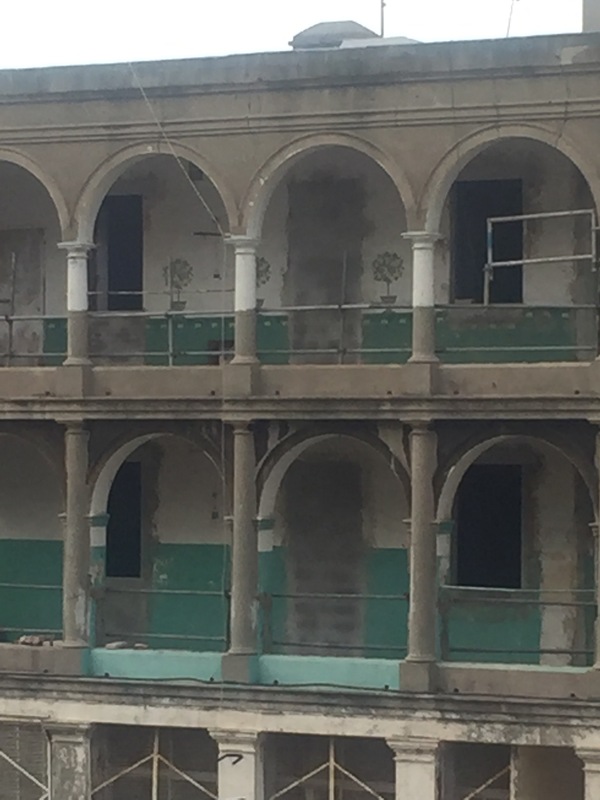 As I walked along Main Street this week with Eldest, he spotted something I’d walked past several times without noticing (in fact it could have been there for months). Our favourite place for holidays (Southwold, in Suffolk) is featured on the side of Marks and Spencer in Gibraltar! The pictures in the photo shoot must have been taken on Southwold Pier and on the beach near by. You can read all about Southwold Pier here. We had a trip to the cinema this week as schools closed for Christmas, to see the new Star Wars film. I really enjoyed it, not as much as Force Awakens, but it was still really good in my opinion and a great start to our Christmas holiday as a family. Yesterday, the last Saturday before Christmas, we decided to avoid the shops at all costs. We figured that if we didn’t have all we need by now, it was probably too late anyway (time will tell if I did forget anything after all). We headed round to the eastern side of the Rock and had a wander about in Catalan Bay. It was beautiful there – not a queue or harassed shopper in sight. That’s all from me for Sunday Sevens this week. Where ever you are reading this, I hope you have a lovely Christmas with plenty to eat and surrounded by your loved ones. To those of you who find this time of year difficult, I hope you find peace and know that you are in my thoughts. 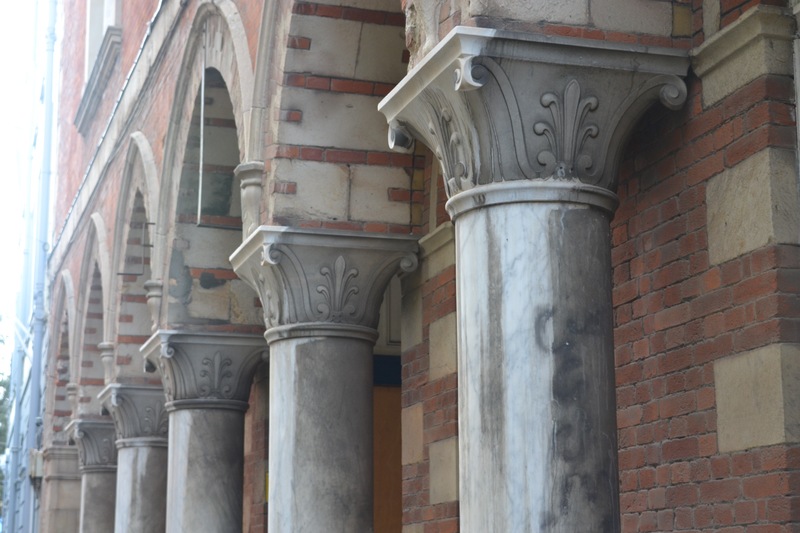 These beauties can be found on the front of the former Police Station in Irish Town. 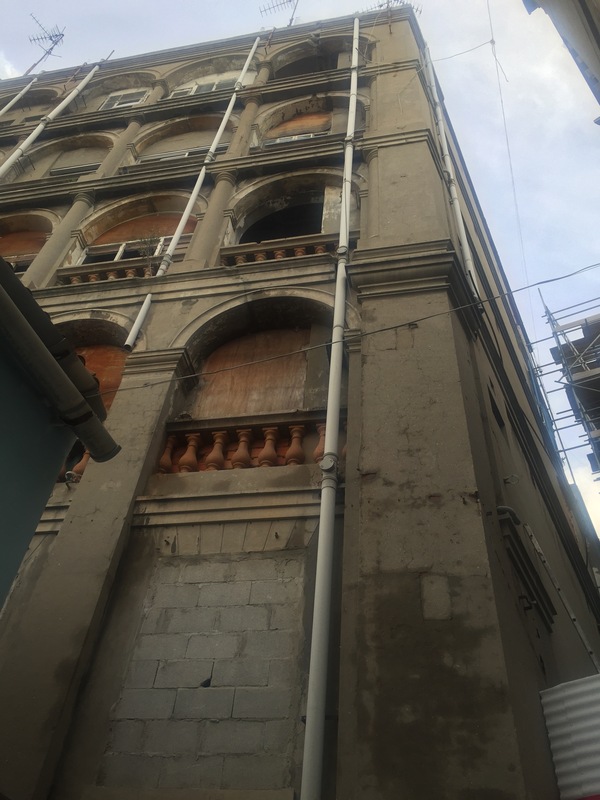 The building is currently unused, so hopefully someone will breathe new life into it soon. It’s too nice to lie empty for long. 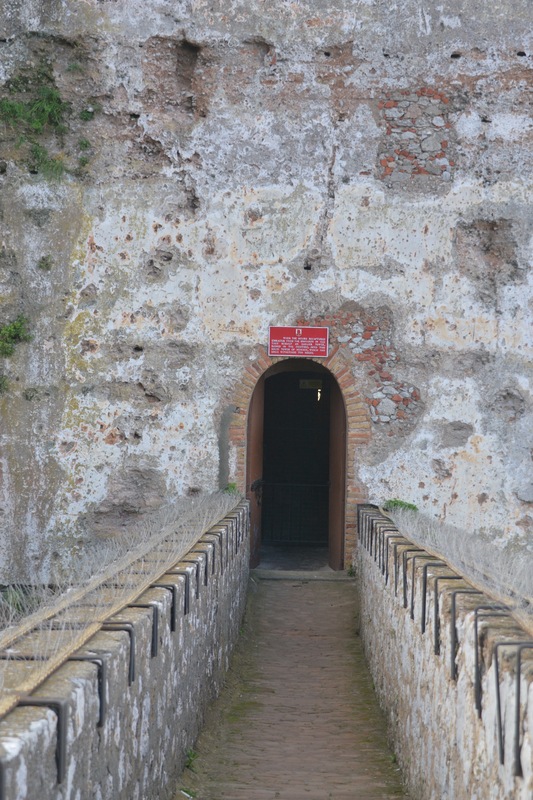 This unassuming arch is the the entrance to the Tower of Homage, also know as Moorish Castle. 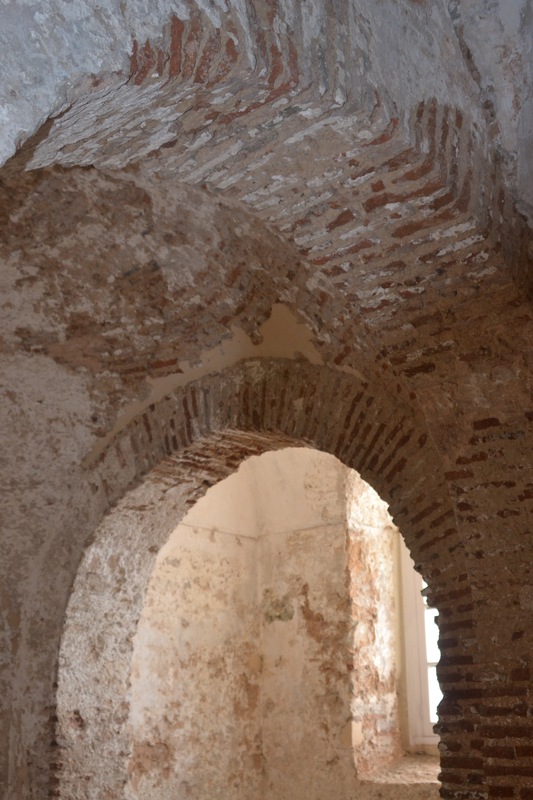 Inside the Tower, it’s full of ancient Moorish arches. 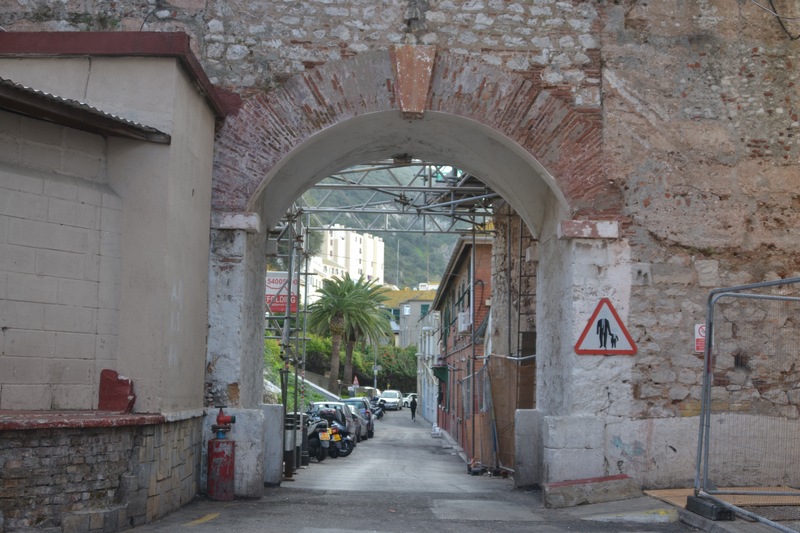 Gibraltar’s old city walls have a fair few arches cut into them to allow for traffic. 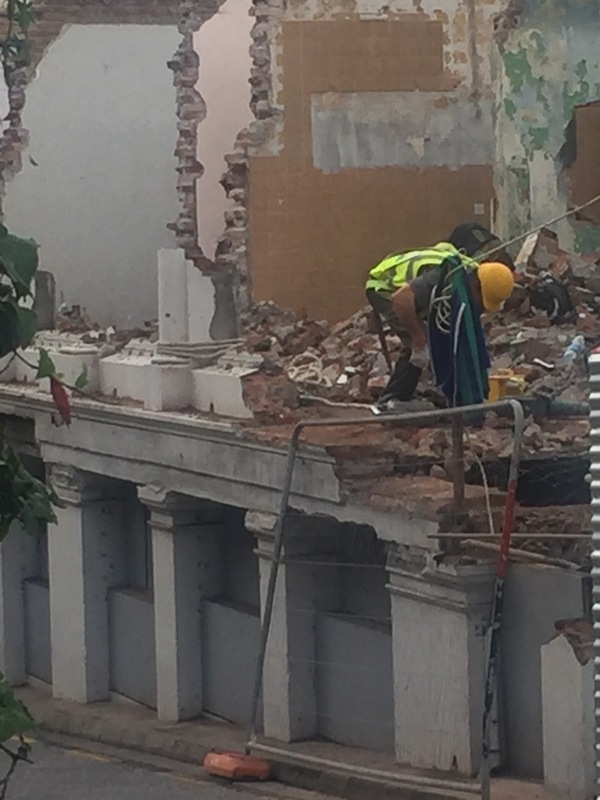 Although some are no longer there… owing to a redevelopment called ‘The Arches’. 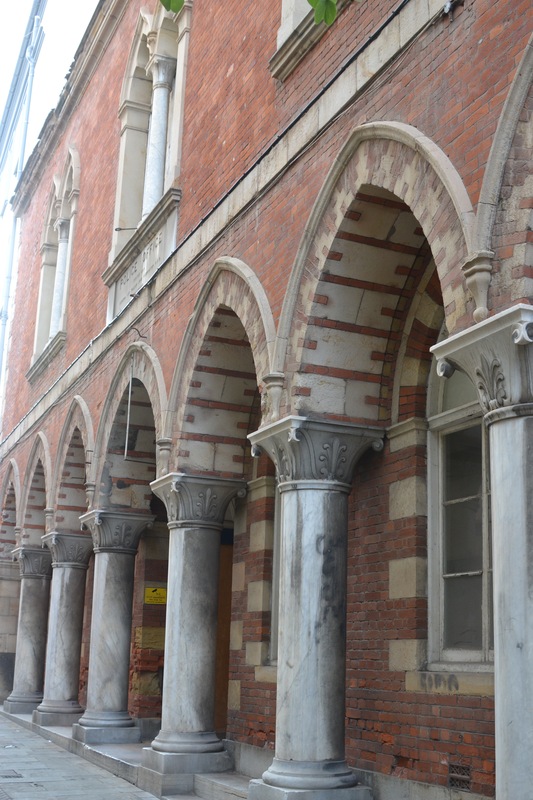 Sacred Heart Church boasts elegant arches on its entrance porch. 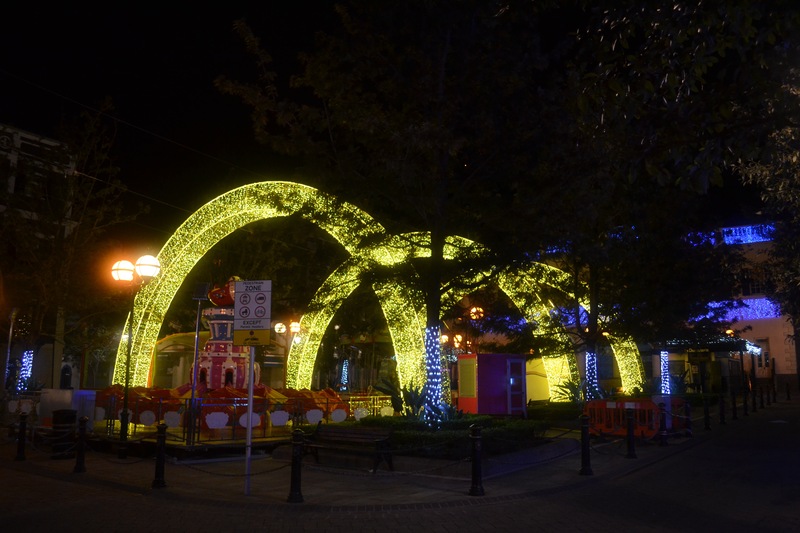 We even had brightly lit Christmas light arches last year!